It’s time to look at a very old PS1 game. I actually have a few of them that have been waiting for their chance, but since the bulk of them don’t have any story modes and aren’t even recognized on the backlog there isn’t much of an incentive to playing them. Still, while I wait for Undertale to show up it’s a great opportunity to blast through this one. It’s a fairly fun game although it’s one that is naturally quite limited. There are a few main modes here like Time Trials and Single race, but you’ll be spending most of your time in the quick career mode. There are 11 races in this mode, but you only get to keep going if you have enough points. I had to retry one of the races real quick since I didn’t qualify so make sure you save after each race in case the next one doesn’t go as you planned. As long as you average in the top 3 out of 6 you will typically be okay to keep going. I ended up with 3rd in the tournament but apparently that wasn’t quite good enough so then you get a cutscene of the main character crashing. It feels pretty bad, but I like how the game has a sense of humor. Even when you pause the game there are extra options in case you are confused and the game tells you to make up your mind or go ask a friend. There aren’t enough stages for 11 levels though so a few of the levels are used twice. I think there were maybe 8 unique levels which isn’t too bad I suppose. To make the final 2 stages a little harder they made them take place at night time. I don’t think that was the best move as it’s just super hard to see where you’re going. If a computer is going to beat me then I want it to be legit, not because I’m just crashing into everything. Still, I guess I appreciate the fact that they did something to make the level experience a little unique. That’s still pretty cool of them. The graphics are really old. This game certainly doesn’t hold up nearly as well as the original Spider Man game but I guess it doesn’t look bad either. Everyone just seems a little blurry and of course it can be hard to see the turns in the level in time. When it comes to the soundtrack it is fairly generic. The game once again adds a little personality with how enthusiastic the announcer is. I think the game did a good job there. I don’t think I really need to describe the gameplay here as you could understand it with a glance. You are driving a motorcycle/bike and trying to be the fastest to make it through the course by the end of the laps. You can go for style points by pulling off tricks after jumps, but it is risky since if you mess up you will crash and lose a lot of time. You can also target players by performing a wheelie but if you don’t hit them at just the right angle then you’ll be the one who crashes. I couldn’t quite get the angle right so I gave up after a while, but it does give some nice depth to the gameplay. If you manage to master all of the extra gameplay techniques and such then I think you will be quite ready to take on these computer opponents. There isn’t much replay value here though. Most of it will come from the multiplayer mode of course, but your friends will probably be playing some other racing games instead so I’m not sure if it’ll be enough. The single player content is only good enough for around 1-2 hours so you just need to make sure that you’re getting a good price. If so, then it’s time to pull the trigger on this game. Overall, I think the game is reasonably fun. It may not be a racing game that you will particularly remember after playing it, but there’s nothing wrong with it. It’s just a situation where there are now many more solid options to play for racing games. If you can find this game for a dollar or two then by all means you should check it out. It’s a good game and I’d recommend it. I do think that I should have gotten a medal or something for 3rd place though. 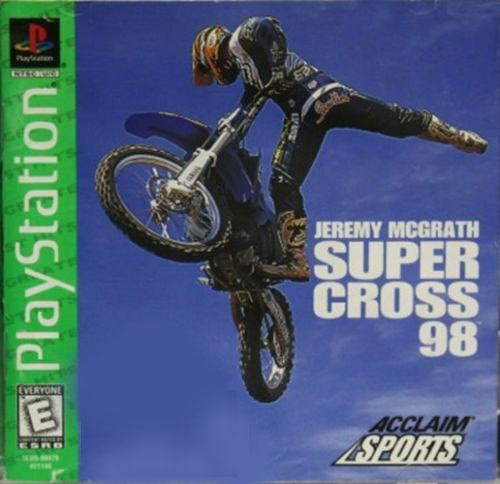 This entry was posted in 6 Star Games, Game Reviews, Games, Reviews and tagged Biking, Game Review, Jeremy McGrath, Motorcycle, Playstation, Racing, Review, Sony, Video Game Review by dreager1. Bookmark the permalink.